Gah! WordPress is broken so I am unable to edit this post! So yes, I know a chunk disappeared, I just can’t fix it! Will try again later. from amazon forum, seems that Gatcha gacha will be out nov 2010 (here) scroll down to middle area Marco Pavia posted. If you ever go to novel mode, I’d recommend “Old Filth” by Jane Gardam, and its prequel “The man in the wooden Hat” – They are really interesting. I really like them. I’m sure if you set aside a couple of weekend, you’ll finish them. My problem regading tbd pile is since I know they’re there I can always get to them later, you know. Meanwhile, other books from library are due so I have to read them first. The cure for me is to stop finding new interesting books/manga and read interesting ones that I have and then get new ones. However, that rarely works. Only once, though. Procrastinating. I finally read Swan and really like it. It reminds me of “Glass Mask” which is 44 vol and counting. Good thing I have only 15 volumes to catch up, and then one volume per year based on cmx release schedule. I’ll keep those two books in mind. I read the description for the first one – it sounds rather grim! I’ll note the titles for when I get back into reading something other than fantasy. Though I just started watching Criminal Minds and I rather like it, despite my best intentions. The first two I saw were kind of lame, but it was good to listen to while I worked on my new blanket and I got sucked in. I’m not even crocheting while I watch anymore. heh. TP has a really cute series called Karakuri Odette that I really like. Yeah, I tried to be more selective, but sometimes can’t resist the sale and the wanting of trying out a new series. True, the part about Raj orphans… I wasn’t sure if you like fiction in general or any particular genre. For fantasy, I’ve read “Demon’s lexicon” which I thought pretty good and interesting. It’s the first of a trilogy. Are you willing to sell any of those mangas?!?!? 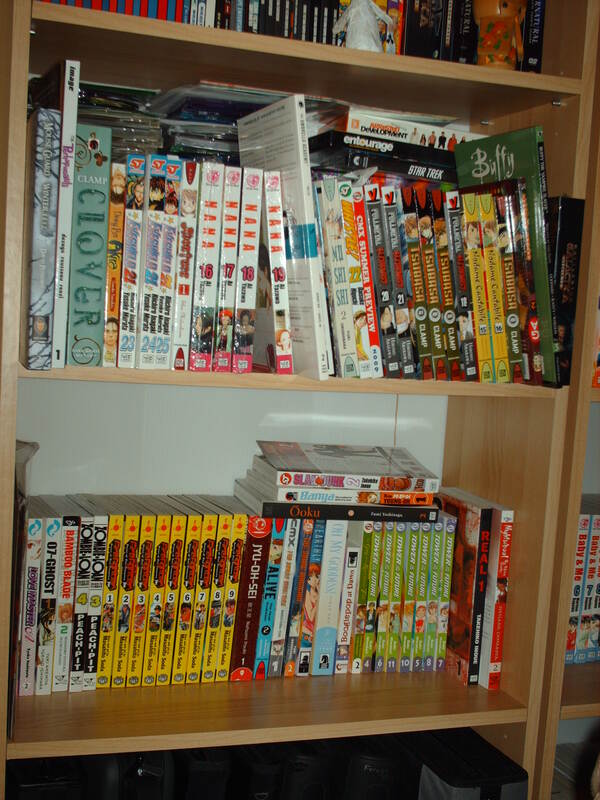 I LOVE mangas, i got into them recently and I already have a whole shelf full of them that I’ve recently read through at LEAST twice. I can take those mangas off of your hands if you really don’t want them!